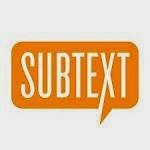 Let's talk about one of my fave apps.... Subtext. 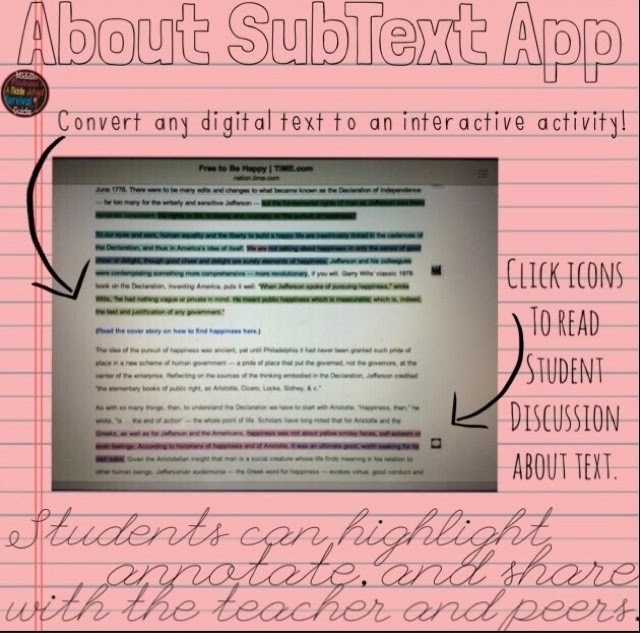 Subtext is an awesome app that allows students to annotate, collaborate, and interact with a text in new and exciting ways. I love it. It is a wonderful way to read informational text and practice annotation skills. "An eReading program for K12 schools, Subtext is an iOS app that brings reading to the digital world where today's students live, play, and learn. When educators embed questions, discussion prompts, polls, videos, and web links in digital text, students begin to read closely and with purpose. " How I start using Subtext? 1) Find an online text that can be incorporated into your lessons. Any online text can be easily converted into a Subtext article for students to read. There are also articles pre-uploaded and offered on Subtext as well as an option to purchase longer texts. 2) Decide how it will be best used in the lesson. This can be used as a class activity or at home as a flipped classroom activity. Students annotate text with the option to share annotations with teachers or the class. It works best as an ipad app but also works on the internet. 3) Set expectations for the students and clearly model. Clearly model how to navigate the app on an iPad and on a computer and set behavioral and academic expectations (see tips below). There will be some troubleshooting since it works differently for both...so make sure to do it together. Once the routine is set, the app will be easy to incorporate for the rest of the year. What subjects can I use Subtext in? Students read articles and books digitally and interact with the class about what they are reading....so any subject that you can read text for! 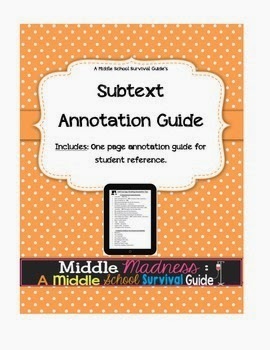 How do you guide students in using SubText? 1) Have strong expectations for digital citizenship using the app. This is something my district already has in place and student have signed contracts for, etc. 3) Make sure to model usage of the app and the different views. Viewing and interacting on the app looks different when you compare it on the iPad vs. a computer. Make sure they know how to best navigate both. We usually model every time we use it.